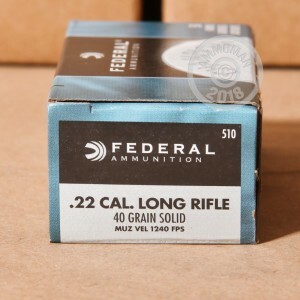 This .22LR ammunition is a solid-performing yet inexpensive target load that fires a typical 40 grain lead round nose solid bullet at about 1,240 feet per second, putting it in the high velocity category. 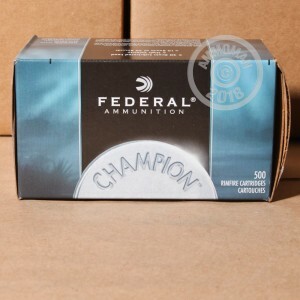 These cartridges come in a "brick" of 500, which contains 10 boxes of 50 rounds each. Like other Federal rimfire ammunition, they are loaded in Anoka, Minnesota. 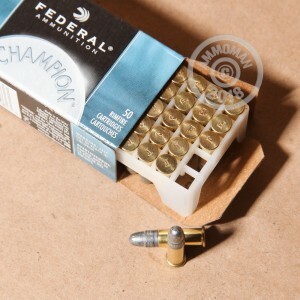 .22 Long Rifle can be a pain to find sometimes, so stock up at AmmoMan.com today! Place an order for $99 or more to qualify for free shipping and push down the cost of your shooting even further.